Gas Trains designed with safety in mind. All gas trains have dual valves on the pilot line and main, low gas pressure switch, high gas pressure switch, and proof of closure. 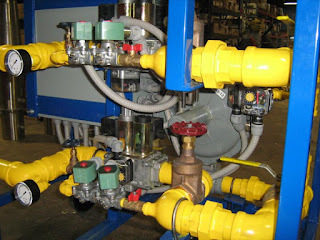 Fully automatic units are supplied with a 4-20 mA controlled actuator that regulates gas. The control system includes a power-on switch, power-on light, master controller with 4-20mA slave controller, air-on light, gas-on light, ignition-firing light, burner-on light, high-fire light and high-fire switch. Should the limit switch fail system come with a dump button and procedure for clearing the gas out of the lines. Construction is 1.5 inch powered coated tubing. 750VA transformer 480/120 for power to the train. Burners are 316 stainless steel. Three standard sizes: 6-10 million BTU; 3-6 million BTU burner; 1 million BTU burner.